The outcome of every project is unique and so is the process to get there. But if you want to know how we work and what to expect, here is an overview of the typical workflow process. Getting to know you and learning about your vision for your space is step number one. We want to see the site, understand how you plan to use your new space, exchange ideas, take measurements and get a general feel for the property. It’s a relaxed and casual meeting. We know it’s important so we will never rush you. Within ten days of our first meeting, we deliver, by email, computer-generated first blush drawings/diagrams together with a rough budget. Together we review likes and dislikes, opportunities to refine the design and improve and refine the design as well as add the finer details. This process typically involves back and forth communication. No rush. It’s critical you are entirely happy with the specification. We may even create a three dimensional model to help with visualization. We prepare engineering drawings (approximately one week), apply for a building permit application and await approval before starting your project (approximately four weeks). Choice trees and plants are removed and protected in an on-site, or off-site, nursery so they can be returned safely at the end of the project. This is the loudest, messiest part. Big machines, noise and dirt. What every boy loves to watch! Things are put into place that disappear. Rebar, irrigation and plumbing, electrical. Pool and waterscape shells are set with concrete spraying. 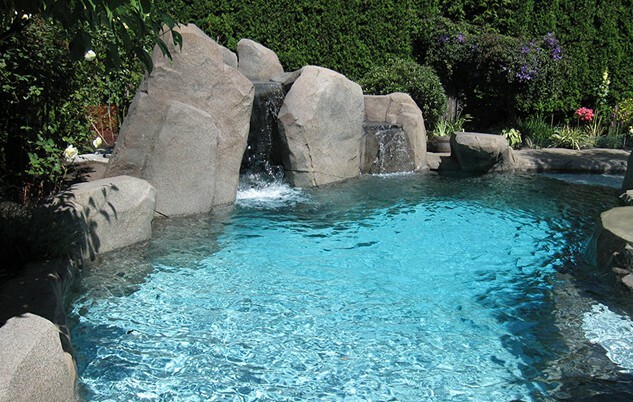 Decorative concrete work, artificial rock structures are sculpted with rebar and mesh forms before concrete is applied and painted to reflect and match the natural surroundings. We are qualified in shotcrete construction for decorate and uniquely shaped structures. Pump house, cabana, indoor kitchen etc. is put into place (often in tandem with the decorative concrete work). Topsoil and garden compost laid and the finishing touches are applied, beautiful foliage is planted and your space comes to life ready for you to enjoy. We work to plan but we are consciously aware of emerging opportunities to improve on the design at all times. That’s why we stay in constant communication with you all the way so we can exchange ideas and explore opportunities for the perfect outcome. You can count on us to be diligent about ensuring you are fully trained on how to use the features of your beautiful backyard. And we can take care of ongoing maintenance, so you don’t have to worry about keeping your outdoor space in tip-top shape.